My Rating: Excellent for anyone wanting to get out of debt and have enough to live on now and in retirement. I am so glad I was given the opportunity to read this book! With clarity and ordinary language, Steve Repak shares from experience how to get out of debt, how to save money and still have enough to live on, and how to prepare for a financially secure retirement – starting now. In Dollars and Uncommon Sense you will find sound information and advice. The author, who is now a successful financial adviser, came out of the army with over $32,000 in credit card debt. He struggled to break free of that and eventually figured out how to efficiently pay it all off and still get ahead. In his well-written book – which is as easy to read as it would be to sit down and talk with him – he tells it how it is while helping the reader set up a plan for wise financial transformation. At the end of each chapter is a summary of the main points. At the end, Steve Repak has a section called Useful Websites, a Glossary of the words perhaps hard to understand, and Worksheets that can also be downloaded from his own website. He seems to have made every attempt in this book to help the reader understand how debt can be handled, and how to live with adequate funds while also saving for enough to live on comfortably in retirement. It is never too late to apply his methods. For anyone too young to even be considering retirement, this is the very time to begin the plan! You won’t regret it. 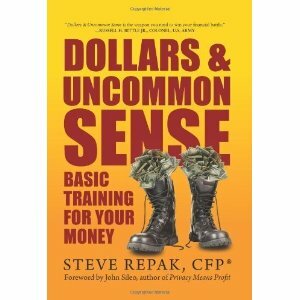 You can find Dollars & Uncommon Sense: Basic Training for Your Money listed on my BUY THE BOOK! page. This entry was posted in Mostly About Reading, Reviews & Interviews and tagged Credit card debt, Debt, Dollars & Uncommon Sense, financial planning, get out of debt, how to save money, non-fiction, Personal Finance, plan for retirement, Steve Repak. Bookmark the permalink.